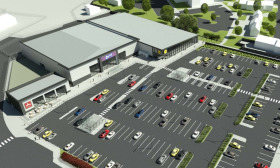 Plans have been submitted to build a new Lidl supermarket, B&M home store and garden centre in Crewe. Clowes Developments (North West) has lodged a hybrid planning application with Cheshire East Council to transform an 8.9-acre site between Mill Street and the railway lines just a short walk north of Crewe town centre and Crewe train station. The site currently accommodates a single industrial building that was until recently occupied by a car parts distributor while the rest of the plot contains hardstanding and overgrown waste land. The applicant is seeking full planning permission to clear the site and construct a new retail park comprising a 24,197 sq ft Lidl supermarket, a 23,002 sq ft retail unit for B&M with an associated 7,502 sq ft outdoor garden centre, a 2,497 sq ft retail unit for an unnamed coffee shop operator, and a 272-space customer car park. The proposed scheme is expected to create up to 150 full-time and part-time jobs. The site had previously been the subject of a retail and residential development of a similar nature and scale to that now proposed, according to an accompanying planning and retail statement by Plan A (North West). Delivery of this scheme was put on hold pending the preparation of the HS2 masterplan, which sought to identify what land would be required for the high-speed rail project in Crewe. This outline planning permission expired in 2016. A design and access statement by Corstorphine + Wright said: "The quality of proposals and the nature of such a well-positioned site would assist in enhancing and complimenting the surrounding area. "The regeneration of this site for much-needed retail and restaurant development of an appropriate mix, type and density is a positive outcome. Furthermore a boost to the local economy by creating additional employment is another invaluable benefit." Cheshire East Council has set a target decision date for the scheme of 2 January 2018.